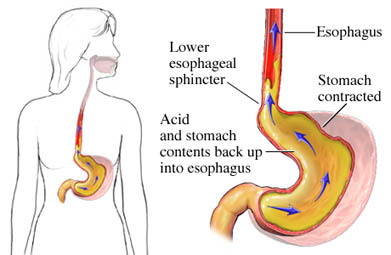 Gastroesophageal reflux disease (GERD) is the backup of stomach acid and other contents into the esophagus. This is thetube that runs from the back of the throat to the stomach. Heartburn is a burning feeling behind the breastbone. It's the most common problem with GERD. This type of heartburn happens more than 2 times a week for many weeks. The esophagus and stomach are designed to move food downward. The lower esophageal sphincter (LES) is a ring of muscle. It’s found at the far end, closest to the stomach. It relaxes to let food pass into the stomach. Then, it closes shut to keep it from backing up. The stomach squeezes, contracts, and mixes with acid. This helps to break down food so the body can use it. Sometimes, the LES doesn't close the way it’s supposed. Other times, it relaxes at the wrong time. The acid and other contents in the stomach are pushed backwards. This causes heartburn. It can also happen when you're lying down or bending over. Over time, stomach acid wears away the lining of the esophagus. It can lead to problems such as wheezing, stuffiness, or changes in your voice. The longer you have these problems, the worse they become. Acid can also cause bleeding, stricture , or inflammation. The acid also changes the cells in the bottom part of the esophagus. This condition is called Barrett esophagus . Having it makes the risk of esophageal cancer higher. What are the risk factors for GERD/heartburn?What are the symptoms of GERD/heartburn?How is GERD/heartburn diagnosed?What are the treatments for GERD/heartburn?Are there screening tests for GERD/heartburn?How can I reduce my risk of GERD/heartburn?What questions should I ask my doctor?Where can I get more information about GERD/heartburn? Definition & facts for GER & GERD. National Institute of Diabetes and Digestive and Kidney Diseases website. Available at: https://www.niddk.nih.gov/health-information/digestive-diseases/acid-reflux-ger-gerd-adults/definition-facts. Updated November 2014. Accessed August 20, 2018. Gastroesophageal reflux disease (GERD). American Gastroenterological Association website. Available at: https://aga-cms-assets.s3.amazonaws.com/2018214195040---All%5FGERD%5F2017.pdf. Updated July 2017. Accessed August 20, 2018. Gastroesophageal reflux disease (GERD). EBSCO DynaMed Plus website. Available at: http://www.dynamed.com/topics/dmp~AN~T116914/Gastroesophageal-reflux-disease-GERD . Updated September 14, 2017. Accessed August 20, 2018. Katz PO, Gerson LB, Velva MF. Guidelines for the diagnosis and management of gastroesophageal reflux disease. Am J Gastroenterol. 2013;108(3):302-328.